The club has four indoor courts. We maintain a low member to court ratio to ensure court availability. We offer a full range of tennis activities for all ages and ability levels taught by USPTA certified instructors. Meet our staff. May/June Flight Session Begins May 1st! Adult lessons and drills: Typical 90 min group lesson fee is $22+ tax. Sign up weekly at the Front Desk. Non-Members add $15/day Guest Fee & may sign up 24 hrs before the class by calling the Front Desk. ​​​​​​​​High Intensity Mondays 11 a.m.-12:30 p.m.
Ladies Singles Clinic Mondays 12:30 p.m.-2 p.m. Skills & Drills Thursdays 7:30 p.m.-9 p.m. US Open Thursdays 9 p.m. - 10:30 p.m.
Saturday Smashers Saturdays 9 a.m.-10:30 a.m. Skills & Drills: Sundays 9:30 a.m.-11 a.m.
Singles Clinic: Sundays 11 a.m.-12:30 p.m.
Current Equity and Junior Tennis Members may register through our website this year by submitting our online enrollment form that is available below. All other registrations must be done in person at the Front Desk. If you participated in the 2017/2018 Junior Tennis Program and would like to move class levels or will be new to the Junior Tennis Program this Fall, please contact Coach Stephen to schedule your complimentary assessment. Please contact Coach Stephen if you are unsure about which level to sign up for. Level 1: Mondays & Wednesdays 5:00 p.m.-6:00 p.m.
Level 2: Mondays & Wednesdays 4:00 p.m.-5:00 p.m.
Level 3: Tuesdays & Thursdays 4:45 p.m.-6:00 p.m.
Level 4: Tuesdays & Thursdays 3:30 p.m.-4:45 p.m.
Level 5: Tuesdays & Thursdays 6:00 p.m.-7:30 p.m.
Levels 2-5 will have Match Play once a month on an assigned Friday from 4:00 p.m. - 6:00 p.m.
Online enrollment available to current Equity and Junior Tennis Members. 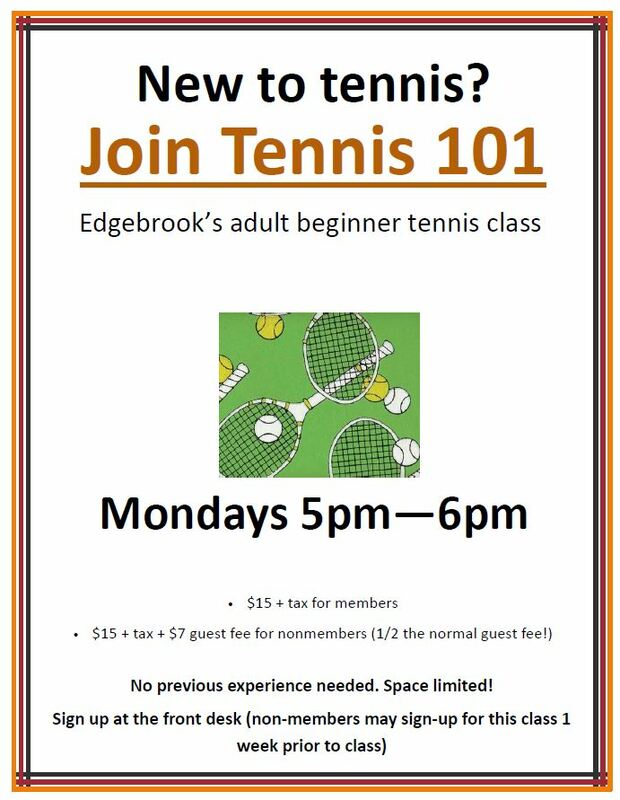 All other enrollments will need to be completed in person at the Edgebrook Club front desk. Please confirm with Coach Stephen prior to submitting form if you are wanting to enroll in a different level than last year. Waitlist - Level 1: Mondays & Wednesdays 5 p.m.-6 pm. Waitlist - Level 2: Mondays & Wednesdays 4 p.m.-5 p.m. Waitlist - Level 3: Tuesdays & Thursdays 4:45 p.m.-6 p.m. Waitlist - Level 4: Tuesdays & Thursdays 3:30 p.m.-4:45 p.m. Level 5: Tuesdays & Thursdays 6 p.m.-7:30 p.m. The Edgebrook Club would like to be able to use photos of players in our publications, promotional materials, and/or the Edgebrook website.